Our story begins in April 1993. During one of our holidays in Kenya we visited a waiter called Solomon in his home in Ukunda. We, being Frank Muether together with Micki und Stefan Wentzel. Solomon’s apartment of approx. 24 square metres allowed just enough space for him, his eight friends and ourselves. The 30 cubic metres of stifling hot air not exceeding 45° C stood as still as a Queen’s Lifeguard during a birthday parade. We exchanged stories and discussed avidly about the differences between Africa and Europe.The mood was superb or rather it was much later after savouring several beers mixed with brandy. That had consequences. A few hours later we thought we had solutions for all the problems in Kenya. 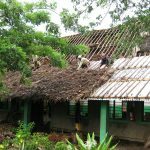 One of the problems being, that there were not enough good schools for children in the community of Ukunda. 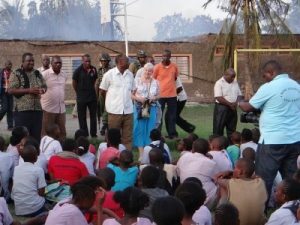 The parents had the choice of sending their children to Koran or government schools (well) and to schools further away in Mombasa. 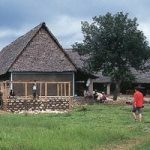 That doesn’t sound like a problem when you have enough beer and brandy under your belt, so we announced in our somewhat tipsy state, that building of a good school in Ukunda should be relatively easy. 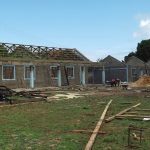 For the purchase of land and the construction of a school building we calculated approx. 25,000 Deutsch Mark (for the younger readers amoung you: that was the currency back then in Germany), to raise that amount we considered it done. Propelled by the idea to save the world or at least Kenya, we promised our kenyan friends to do our very best when returning back to Germany. The next day sobriety settled in and with it came our first doubts, however after our boastful announcements we did not want to go back on our promise to the Kenyans and we owed it to them to at least try. And we were lucky. Back in Germany after quite a short time we were able to find a company, which agreed to donate an initial 25,000 DM and depending on the progress of the project would actually donate 50,000 DM in total. During the following three (!) years we travelled more than a dozen times to Kenya setting up the project. 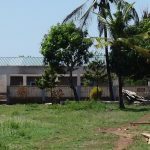 With the help of Jeremiah (Jerry) Murungi, who then was Resident Manager of Robinson Club Baobab (now: Baobab Beach Resort), Solomon and his friends a plot of land was bought, a school building contructed, teachers were hired and the necessary bureaucratic hurdles were overcome. 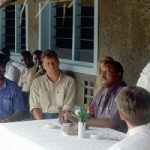 In May of 1996 the Manuel Alexander School was officially opened, being named after the son of the owner of the company, who had enabled the project to begin thanks to the generous donation. The Manuel Alexander School was to become the first of six schools, which are under the umbrella of Mekaela Academies. In June 2016 we celebrated our 20 years’ anniversary and what started with three founding members is now a society with twenty members and more than 1,000 supporters,and as we are still full of ideas, energy and enthusiasm it is not unforeseeable that more schools are yet to come. Or other exciting and useful projects. Nowadays Mekaela Academies is teaching around 1,500 children from kindergarten through to A-level standard. All schools consist of a boarding section, however you have to picture something quite to The Famous Five stories and in now way does it have anything to do with being ‘elite’. 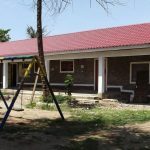 The boarding section costs a little more than the total cost for transport and meals, and without trying to make the circumstances sound any worse, this means that children are able to experience better facilities, more security and better standard of life. More than a 1,000 students have gone through Mekaela Academies to this day. 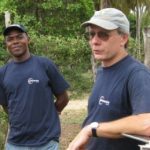 Many of whom are now studying or studied in Kenya, but also those in Europe or have a career and some already have a family. More than half of the pupils were sponsored and almost all stay in regular contact with former co-pupils and the schools via a alumni network (old boys and girls alumni). They all state the same: without an education in the Mekaela Academies, supported by certain programmes or directly by a sponsorship, their life would never have been possible without hardship, poverty and a lack of prospects. In addition to the founding of Mekaela Academies during the last 20 years we were able to establish other projects, which have been of benefit to the people in the region. 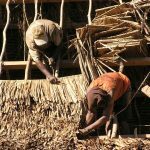 We have two farms in operation with a total of 20 Hectare of cultivable land in the nearby region of the Shimba Hills, through which we are able to cover a large part of demand of food supplies in the schools. 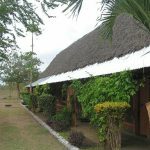 The farms are operated ecologically, no chemicals nor machinery are used. The processes of sowing and harvest are all done by hand, the ploughing with help of oxen. This creates jobs and protects the enviromment. A few years back an employment agency was set up, which organises jobs for family members of our school pupils. The agency does not only create jobs, but also makes sure the employees receive higher wages and that their social-welfare deductions are paid on time. This is often not the case or not taken seriously in the employment sector of private homes. At the same time a free medical coverage scheme was started for our pupils,the MMMS programme (Mekaela Micro Medical Scheme). 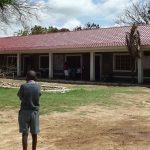 The cost for this programme are 2 Euros per pupil a month. All of the projects initiated and supported by Watoto e.V. are charitable. Should there be any money as surplus at the end of the year (hypothetically), the profit is contributed among the Kenyan employees. We are quite proud of this, never having to explain to a donor how much money flows into the administrative expenses or advertising, as the answer is quite simple: none. These expenses on average of 3,000 Euros per year are taken care of personally by the members themselves. And there is something else we are proud of: The success of our project which we value (in this order) by the contentment of the children, their parents, our employees locally, and our sponsors and donors. So come and find out for yourself, why you would have every reason to be happy as a sponsor or donor of Watoto e.V. The year of 2009 ended for Mekaela Academies with a big bang. 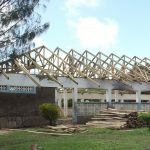 Not so much because of the fireworks at New Year’s Eve, but because of the commitment of Ian McNair-Brown and Nick Finegold who pledged to donate the funds required for a complete renovation of all roofs of MAS and LPS. 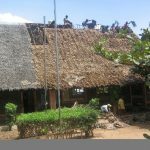 Ian’s and Nick’s help came just in time, and just before the beginning of the rainy season at the end of April all roofs had been replaced. Unlike during the three preceding years the rainy season of 2010 did really deserve its name. It was raining cats and dogs for hours on several consecutive days. That was a blessing for the farms of South Coast (ours, too) but without the support from Ian and Nick our children would have been standing in the rain – literally. More than 3 million people are starving in the North of Kenya. As usual, the children suffer most from the famine. The staff of Mekaela Academies no longer wanted to sit still watching the disaster happen and collected some money together with some parents. They want to start a relief mission into the next refugee camp in the North. About a dozen teachers have volunteered to join the mission. They will accompany the transport and distribute food themselves. Most volunteers come from an area which is less than 70 miles away from the next refugee camp, and they know exactly what to do where they are heading. The Deputy Administrator of Mekaela Academies will lead the mission party. Because the cost for the lorry, fuel, accommodation and provisions of the volunteers is covered by the funds collected by our staff and the parents, we may spend every donated Euro on food. The aid will reach the suffering people in the refugee camp fast and directly. Micki has started a donation campaign here on Helpedia. The ambitious target of her campaign are 10,000 Euro, but that needn’t be the end of it. We hope to send the (first) lorry in the direction of Lodwar, Northern Kenya, in August. We will keep you posted on this website. Tonight, the last remaining volunteers will return to their home in Diani Beach and Ukunda. All, but one. Jackim will probably have to remain in Eldoret Hospital until Thursday. On Friday, his wife Rachel will take him back home. Jackim’s operation – his cervical was fixed with a titanium plate and four screws – went without complications according to his doctors. We will not know before a couple of days if Jackim will be able to use his legs again, and to what extent. Currently he is making very slow progress, but we couldn’t have hoped for more after such a massive injury. Apart from Jackim’s accident our mission was a complete success. 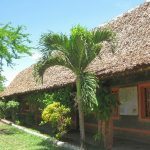 We should be able to send at least two more convoys in the next few weeks, because several hotels from Diani Beach as well as HelpAlliance from Lufthansa and Condor have joined our project. It is amazing which dimensions this project has reached with your help in such a short time. What, if this were just the beginning? After our first relief mission had been such a huge success we have now managed to send the second relief convoy on its way to the North. The volunteers will again distribute food in the area around Lodwar in Turkana. This time the mission is made up of volunteers of our teachers and parents of our students. 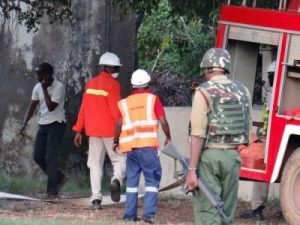 Employees of two hotels of Diani Beach, Hotels Diani Sea Resort and Diani Sea Lodge, have joined the mission, too. As well as support from Lufthansa’s and Condor’s HelpAlliance these two hotels have decided to join the Fanya campaign. Every week they make announcements to their guests and collect funds. 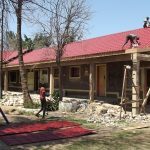 That is of course easier when some of the hotels’ staff have personally been on site in Turkana and can tell you about the impressions and their experiences first hand. 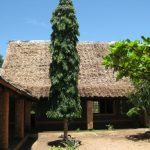 We are hoping that 12 hotels of Diani Beach area will join our project by the end of this year. That provided, we would be able to send a convoy every other month or even week. Our third and most likely last relief mission should be heading to the Turkana region by the end of November. The main sponsor of this mission will be HelpAlliance from Lufthansa and Condor. 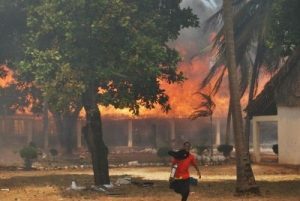 The fund-raising efforts of the Diani Beach hotels was less successful than expected and can cover only a fraction of the cost. At least the hotels will be sending volunteers for this mission and pay for their travel expenses, too. After the last mission will have been completed we would like to publish a short documentary from the many private videos which were taken during the missions on our website and on Youtube. Beginning of December our third FANYA team returned from the Turkana region. This time the volunteers recruited from Mekaela Academies staff only. FANYA 2 had already left our volunteers shell-shocked from the what they had seen. 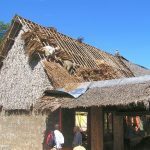 This time it must have been even worse, because the helpers went into the villages to visit the people who were unable to come to the distribution points themselves. What they experienced there has changed their lives. Those impressions have convinced us that we mustn’t give up yet, and we are planning a fourth convoy for next year. HelpAlliance has already made a large donation so FANYA 4 should definitely happen. We have installed a little picture gallery of our FANYA missions on our website. 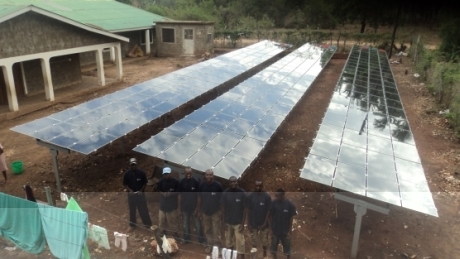 Solar power and Kenya should go well together one would believe. Well, it’s not as easy as that. 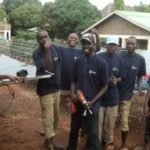 Despite the energy costs which increased enormously over the last few years, the acceptance of the so-called photovoltaic systems in Kenya has not had a break-through yet. But why? The main problem is the national utility Kenya Power & Light Company (KPLC). It refuses to reimburse for any power fed back into the national grid. 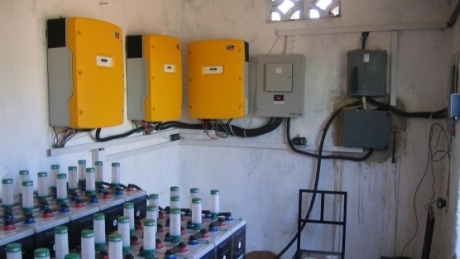 This means that the electricity used at night has to be paid nonetheless, even as the solar system generates a huge surplus of power during the day which benefits KPLC. Of course one can save the excess energy in battery packs, but they would have to have huge capacities and would be equally expensive. Generally speaking, a school can not possibly afford such a system. 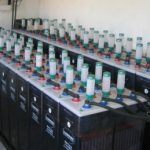 However if a company such as Phoenix Solar AG decides to donate a complete solar power system together with all of the necessary equipment including heavy duty batteries, and sends a technician as well who plans, instructs and supervises the installation, then things look a lot different. 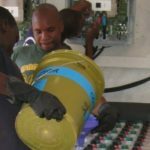 Thanks to Phoenix, Likunda Primary School now has a solar power system, which is so generously calculated that the school can (almost) do without KPLC electricity in the future and still has enough capacity in order to run the water-pumps within the Lulu High School, too. 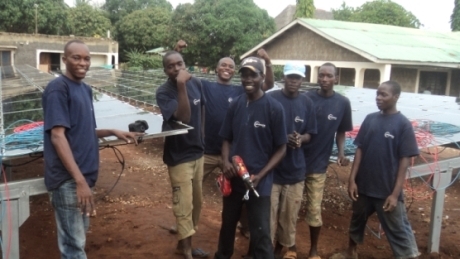 As of today (2011) Mekaela Academies are the only schools in the whole of Kenya, who are running such a solar power plant. The power plant was shipped from Hamburg to Mombasa in two parts at the end of November und during December. While the freight was at sea, Jack and his crew made preparations for the construction. 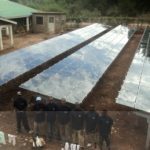 In effect solar power systems are free of import duty in Kenya – well that’s what we thought and actually that is correct. 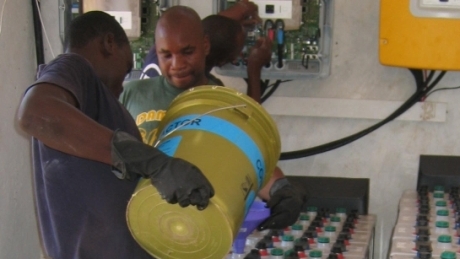 However once the first consignment had been off-loaded and was stored in the Mombasa harbour warehouse awaiting to be collected, the customs authority requested several thousands of Euros as import duties, claiming that only solar cells were exempt of import duty. The same situation we had to expect for the consignment of the batteries, which were expected to arrive a few weeks later. Of course we could have gone through the legal process and certainly we would have been in the right, but when? Time was pressurising us, as the engineer Thomas Schwarz only had a few days available for the assembly of the system because he had to return to Germany under all circumstances. Besides which, every day the goods spent in the warehouse was costing us a lot of money. So we sent two teachers to Nairobi in order in apply for a waiver of the import duties for our solar power plant with the Ministry of Finance. Actually the minister granted the waiver within a few days, and finally we could unload our solar power equipment on the LPS compound. The equipment was still floating on the Indian Ocean while Jack’s crew began preparations for the assembly. construction. We wanted to have a strong and stable stage made of aluminium and steel which would endure the next 20 years of tropical weather. First the workers slammed holes into the corral rock ground into which the support pillars were to be cemented. The whole process was conducted in good old-fashioned manual labour. Once the pillars were in place, the team assembled the panel-support structure. Thomas Schwarz, the Phoenix Solar engineer had calculated the best angle for a maximum utilisation of the sunlight. After that had been done it was time for a break, as the solar equipment was still being held in a warehouse in the harbour. Finally the equipment from Germany arrived at the school. Several tons of high-tech stuff filled the dining hall of LPS: solar cells, bearings, cables, switches, etc. Jack only had three days to assemble the solar cells, as Mr Schwarz had to return to Germany for an important meeting at a fixed date. The first layer of solar cells were mounted on the aluminium bars.Day 1. Still Day 1: the second layer in place and looking good. Day 2: The middle rows are almost completed, by now the team by now has far more experience and the assembly becomes easier and faster. Day 3: The assembly of the solar panels is complete, the cables are lined-up ready for connection to the power-house, the control room of the system. Mr. Schwarz admitted than he had been sceptical but Jack’s crew managed it against all odds. In only three days they managed to assemble all solar panels on their frames. The whole area is almost double the size of a tennis court. Happy and proud on Day 3: Jack and his crew after the job had been done. In the evening a few beers were enjoyed as a thank you and appreciation, which were more than well earned. The success could also be celebrated, as it was Friday after all. After the weekend the batteries were released from harbour warehouse and delivered to LPS. The 24 batteries weigh approx. 6 tons, that are 250 kg per battery. No wonder our boys were struggling, and they had to endure that 24 times! George from Jack’s team installs electronic equipment. Hundreds of cables and connections have to be fixed, but thanks to careful planning and professional guidance the team makes further good progress. 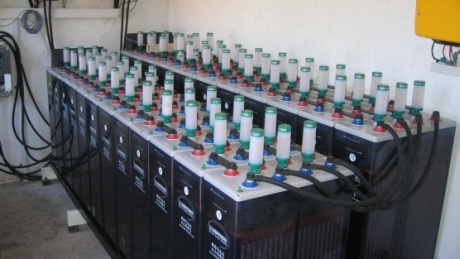 Electricity is already flowing, but the batteries are not yet ready, so most of the power goes to KPLC. Soon acid will be filled into the batteries, the funnel lies already in its place. Today was the first day with a potential for frustration. Well, may it had been running too smoothly to be true after all. It all began when an express parcel from Hoppecke was being stuck in Nairobi waiting for its customs clearance. I am not expecting the parts to arrive before my departure. We then tried to switch to Plan B. We still had plenty of cables left which were long enough, but those cables required customised loops. And it was not possible to find someone in Mombasa who not only had fitting loops but also the tools to fix them. But in the end we still managed to sort out the problem. Also, we filled all the acid into the batteries without any injuries, so I don’t see any more obstacles on our way. Here we go! The acid is in the batteries and nobody got hurt, and all cable are properly connected, albeit according to Plan B. On the evening of Day 8 the whole system is completely assembled, installed, connected and ready to go. Day 9. Everything is set. The sun is shining brightly from a cloudless sky, and power is lowing into the net of LPS and LHS and also charges the batteries. Everything runs silently, only a muted humming is audible in the power house. 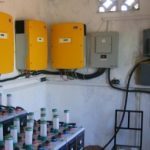 The solar power plant can produce up to 15 kV/h of electricity, and the batteries are big enough to supply enough power during the night. We are deeply impressed and terribly proud. 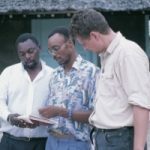 Jack Okello and Thomas Schwarz who warranted the success of this project. 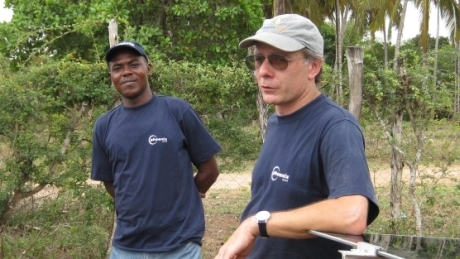 During his stay Thomas Schwarz was able to train two of our technical staff thoroughly enough so they can maintain the power plant and even conduct minor repairs. From Germany, Thomas has access to the system through the internet, so we are never really left without support. That gives us a good feeling. Thank you, Jack, thank you, Thomas, and of course thank you, Phoenix Solar AG. 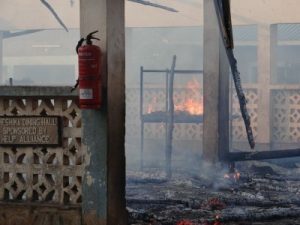 On the 14th February 2013 Lulu High School was completely destroyed by fire within less than an hour, as well as parts of adjacent Likunda Primary School. This is the story of those 30 minutes. 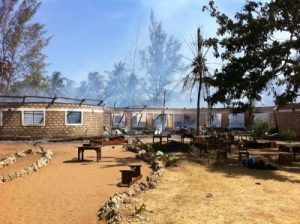 Likunda Primary School: The dining hall has burnt down with only the wall foundations remaining. 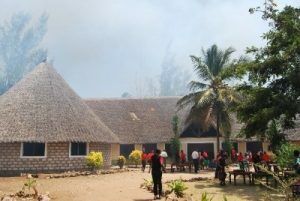 Around lunchtime embers and ash were blown onto one of the makuti roofs of one building of Luku High School from a fire clearing (cut and burn, as preparation for coming rains) from a neigbouring property. 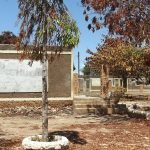 Lulu High School: The classroom wing with the reception area and its adjacent offices could not be saved. 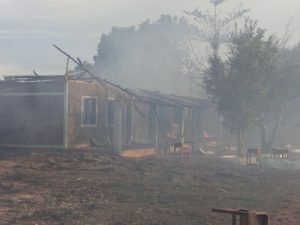 Wind from up to gale force 5 whipped up the fire in an unbelievable speed and spread out even to further away buildings of Lulu High School. 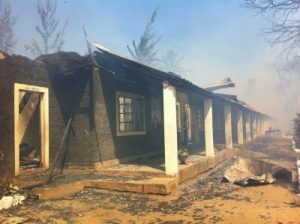 Lulu High School: The Principal’s office has burnt and with it all of the stored school documents. At least the main computer with all relevant data could be hauled to safety. 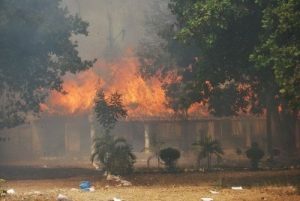 More than half of the buildings of the school complex went up in flames. The damage amounts to roughly 30 Million Kenya Shilling (approx. 300,000 Euro). 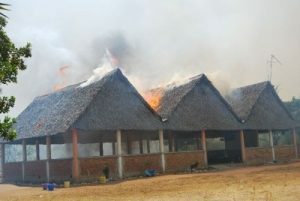 Lulu High School: The complete library of Lulu High School became victim to the flames taking well more than a thousand books with it. Of course Mekaela Academies is insured. 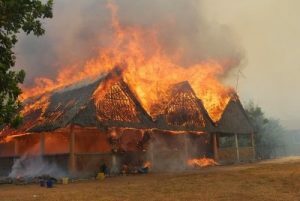 However the insurance will replace at tops half the amount of the incurred losses and that only in a few months time. At least we are hoping. 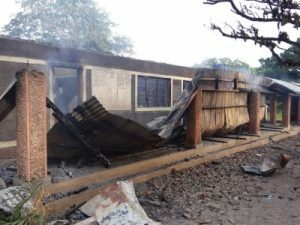 Lulu High School: The inferno of flames destroyed the physics and chemistry laboratories. Luckily there were no explosive substances being stored in the labs. 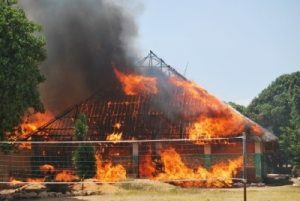 Fortunately no one was hurt, even the hairy and feathered friends (dogs, cats and all kinds of poultry) of the schools are okay. 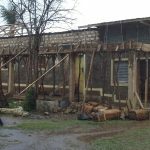 Lulu High School: The Lulu High School classrooms are completely gone except for a few pieces of furniture. Also the adjacent existing trees went up in flames. It is now vital, that the lessons for our up-coming exam graduates of the Lulu High School may continue their lessons. 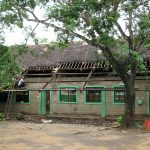 As is the African custom, improvisation is already well under way, but nonetheless we will require a large sum of money for the re-construction and renovation. 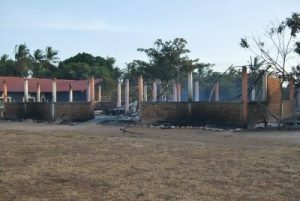 Lulu High School: Fomented by strong winds the fire jumped across to the about 100 m away dining hall which had been completed just recently. Despite all the calamity, we can consider ourselves lucky. The pupils and their parents are remaining loyal to “their” Mekaela Academies. They are tackling it together, mucking in with the clearing from early hours until late. Still none of the pupils have registered with another school. Lulu High School: All rescue efforts were futile and would have been life threatening. 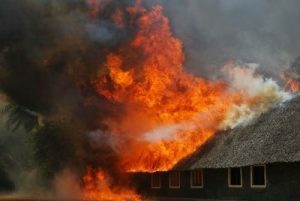 Within seconds massive flames were roaring from the dining hall. After all of the flames have extinguished, we were close to despair. 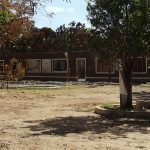 But during the following days we received so much encouragement, offers of help and even some donations, that we are confident: Lulu High School will rise from the ashes like the Phoenix within this year. Lulu High School: The next day the ruins of the dining give a depressing impression, its pillars towering to the sky accusingly. HelpAlliance has already indicated their willingness to support us and Watoto e.V. will set up a website for online donations (the link is still follow) like last year’s FANYA mission. 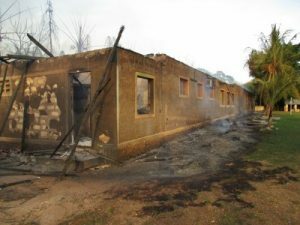 Lulu High School: In the administration offices of Lulu High School all computers, equipment and documents have been destroyed. During mission FANYA we were able to collect donations for more than 100,000 Euros within a few months. Today we are confident to achieve something similar with the help of our friends and our supporters. 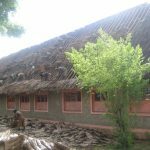 Likunda Primary School: The Kindergarten of Likunda Primary School. Some secondary pupils attempt to rescue everything they can get theirs hands on. On top of the roof the the fire has already started, and it is too high up the slope to be extinguished. The name FANYA is already taken. Perhaps “KAMATA” would be a good motto for the re-construction project. KAMATA is a Swahili word and means “let’s tackle this together” (all muck in, as the Brits say). Less than one hour later: Only the foundation walls remain from the wonderful Kindergarten which was once our most prestigious entity. The new school complex. In the background on the right you can see the new canteen and one of the two dorms. 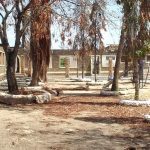 Almost all the trees in the courtyard were burned, but we are reforesting them they are restored. Twelve large park benches will be placed in the courtyard to create a “Reading Park” for the students. You are looking at the restored Physics and Chemistry Laboratories in the left wing. The right wing contains the Library, which is again fully equipped (but still has plenty of room in its shelves). 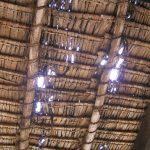 The classrooms have wooden ceilings to dampen the sound and to reduce the heat radiation from the metal roofs into the rooms. The Dining Hall. The inside was completely renovated and enlarged by around a fifth. Now, the Dining Hall has a stage for performances, too. The Dining Hall seen from the other side. The old hall ended where the small staircase is, so the building was extended by about 30 feet. The extension contains the stage, among other facilities. The Dining Hall was originally designed for just 400 children. When LPS went double-stream with more than 600 pupils, the hall had serious space problems. That’s history now. 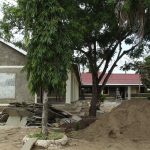 The new Canteen of LHS has been not only extended, but will also be equipped with a huge kitchen which it previously did not have. 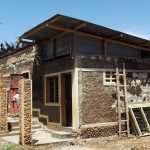 The kitchen is still under construction, and because it is quite expensive, we are building it as the funds trickle in. The Canteen will remain a construction site for some time. This panoramic image shows how spacious the Canteen has become. Here, the students sat for their written final exams in November. The desks where the tests will be taken away after the holidays. Everything could look much nicer, cleaner and fancier, but we are so glad that we are again able to provide a decent environment for our students, that we don’t really care. The pride and joy of LPS: The designer-kindergarten, built by an architect from Berlin. It burnt down to the ground within minutes on Valentine’s Day. 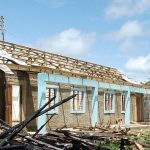 The Kindergarten had been almost completely destroyed, nearly all walls and even parts of the foundation had to be re-constructed. 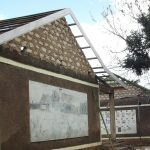 And building the roof with metal sheets was serious challenge which took us weeks. 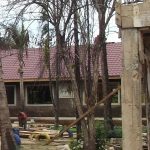 We had considered to stick to the original design with Makuti roofs, but we couldn’t convince neither the children nor their parents. The shock from the events at Valentine’s Day is still too present for them. And metal roofs are the most reasonable solution after all. And then: metal roofs don’t look that bad, do they? 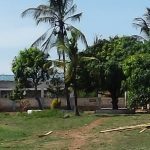 On the 4th April 2015, Easter Saturday, branches of a tree came into contact with an electricity cable, which was in the proximity of the L-wing of the Manuel Alexander School. The sparks landed on the roof of the L-wing which despite the heavy morning rainshower, caught on fire. Manuel Alexander School: The L-wing, here is where the fire began. The strong and changing wind carried the fire very fast. 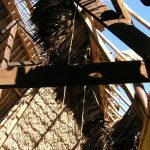 The roof of the T-wing was the next to burn, the largest building of MAS. Here books were being store among other things, brand new books for the whole school year in the value of 20,000 Euros. They could not be saved. Manuel Alexander School: The T-wing with the library and the computer laboratory. Base Titanium sent their fire brigade, but the fire-engine’s tank holds approx. 2,000 litres and we have no water hydrants nor any other source of water. After a few minutes the firemen could only stand there watching the scene helplessly. 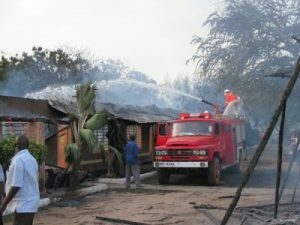 Manuel Alexander School: The Base Titanium fire brigade (thanks alot guys) could no longer do much more. 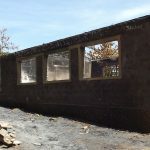 Within minutes the fire sprang across to the classrooms of Mekaela Heshima Primary School. They are situated near to the L-wing of the MAS. Within a very small amount of time they too stood in soot and ashes. 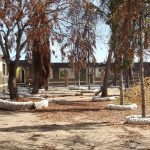 Heshima Primary School: The destroyed classrooms (Std.1 to 3) and the toilets. We do indeed have fire-extinguishers, but they are only useful when a fire has just started and they do not reach as high as the roofs. 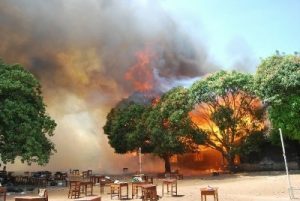 A few pieces of school furniture could be saved from the blaze. 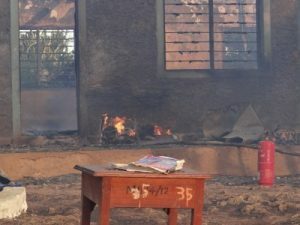 Heshima Primary School: An emptied fire-extinguisher in front of a burnt down/destroyed classroom. 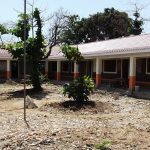 Several months ago we had just completed building two new classrooms of the HPS. They too went up in smoke. Heshima will have to be reconstructed first, so we are able to resume classes as soon as possible. 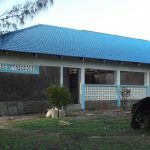 Heshima Primary School: The classrooms of class 4 and 5 pupils. These are the first ones which will have to be repaired. 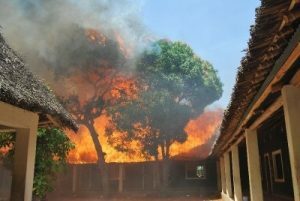 Although the HPS dining hall is more than 50 metres away from the classrooms, the fire was able to jump across, the wind was so strong. The light-weight plastic chairs could be brought into safety, but the heavy wooden tables made with steel frames had to be left to the flames. 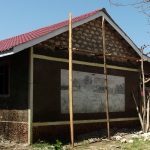 Heshima Primary School: The dining hall is to be reconstructed quickly and to be used as a make-shift area for lessons. With the help of many neighbours (thanks to Helmut and his crew) laptops, office equipment and many other items could be brought into safety. Manuel Alexander School: A pupil is watching over the items. The value of which should be approx. 20,000 Euros. A fire like this does not only attract helpful people. 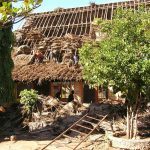 Thousands of Kenyans are struggling due to the recession of tourism at South Coast and many struggle to survive. 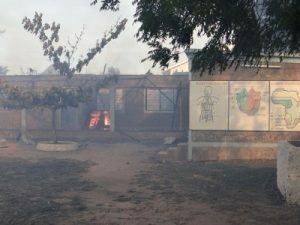 Manuel Alexander School: As soon as the fire broke out, the police were called. They sent armed police to keep the potential looters at bay. 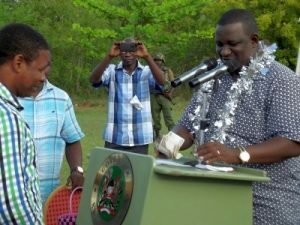 In the afternoon even the Governor of Kwale came to the schools and held a supportive and encouraging speech. His younger children attend Mekaela Academies and he said we are to expect his full support. 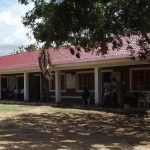 Manuel Alexander School: Encouraging words from the Governor to the disheartened teachers and pupils. 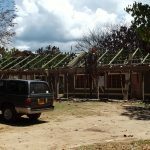 About a week later we held a Harambee, to raise money for the reconstruction. 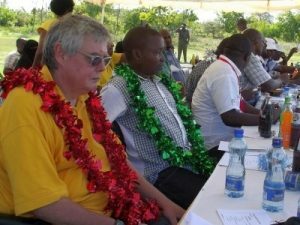 Under the patronage and the gentle persuasion of the Governors we managed to collect almost 2 million Shillings, around 20,000 Euros. A good start. 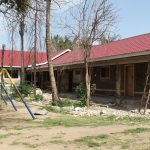 Manuel Alexander School: The Governor collected the donations personally and had his bodyguards deliver the money to our bank. Frank was present at the Harambee, too, Until the completion of the reconstruction of the schools, he plans to drive with his Tuktuk (not that he would drive himself) to the schools every week and watch the progress. Manuel Alexander School: Frank’s face gives away his downhearted mood at the Harambee. 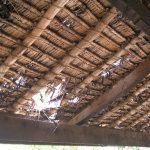 The total damage is estimated at 270,000 Euros. The insurance will cover not more than 50% of it, most probably even only 40% according to our experience two years ago. 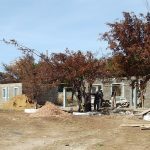 So far we have commitments from our reliable project partners for 55,000 Euros and expect to be able to increase that amount to 100,000 Euros. The balance will have to be raised through individual donations. 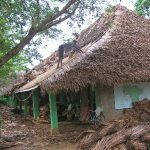 We have time to provide classrooms and teaching materials for about 400 children until 4th of May. 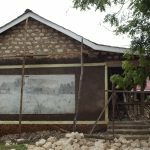 We shall begin rebuilding the classrooms and the dining room of Heshima first, so we will have space for 8 classes and the kindergarten. After that we will have plenty of time to rebuild MAS. “Changamoto” is the motto for our reconstruction project, which means “Challenge”. This is our defiant message to fate: Challenge accepted! We won’t give up. 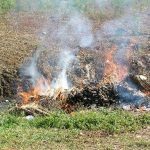 The clean-up started on Monday, April 6th. 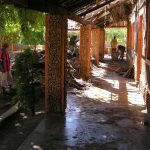 Within a few days most of the dirt and sooted debris were disposed of, and on April 10th, we started the reconstruction. HPS first, then MAS, and until May 4th when the school holidays ended, we started operations again at HPS and in the open. By the end of August, MAS was completed. Below, we recorded the progress of reconstruction with images. For the satisfaction for those who have already donated, so that they can see the fruits of their support. And of course to motivate of those who haven’t donated yet but consider doing so. The images are reduced in size, otherwise they wouldn’t have fitted in the frame. If you click on an image it will show in its original size. Today, on 31.08.2015, both schools are completely re-built. 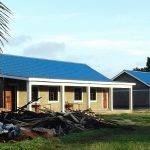 The school holidays end on 02.09.2015, on that day our children move into beautiful classrooms of MAS with new furniture and equipment. We still lack a few things like fittings, but after almost exactly five months and more than 250,000 Euro of donations we may proudly, happily and relieved declare that not only we accept the challenges of reconstruction, but mastered them. In Swahili we say: Tunashinda – we succeeded.